Your Samsung Galaxy S 5 Camera application can also function as a digital camcorder. So, whenever you have your phone you are able to capture moments from your life on video. All you need to do is to put your camera into Camcorder mode. From the camera viewfinder, you tap the icon with the silhouette of a movie camera in the upper-right corner and you switch from photographer to videographer. 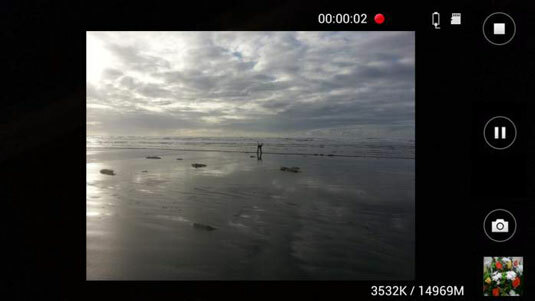 If you press the Pause button while in camcorder mode, the buttons to the right morph into the options seen in the small image below. You can tap the upper button to switch back to the camera. Your other option is to tap the button with the red dot to begin recording again. Your phone is not only recording the video, but it’s also recording the sound. Be careful what you say! You can get fancy with some of the settings for your camcorder, but you won’t find nearly as many settings as you have for your camera (fortunately!). 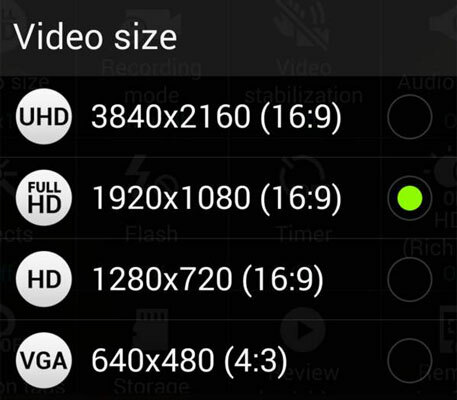 Three settings: Video Size, Video Stabilization and Recording Mode, are available in settings from the menu button. You cannot get to the setting screen from the camcorder viewfinder. You must stop, which brings you back to camera mode. From there you tap the menu button to get to settings. UHD: This is Ultra-High Definition TV, the high-end setting. Video clear enough to discern everyone’s wrinkles and pores on your Samsung 65-inch Ultra HD TV. If you have a UHD TV and want to get the full effect from your home videos, by all means use this setting. An inexpensive 32gb memory card can store about an hour of video in this format. Full HD: This is the default resolution. In television terms, this is the maximum resolution offered by high-def video formats, such as Blu-Ray. A 32gb memory card can store around five hours of Full HD video. HD: This is still a high-def format, but it’s not as clear as Full HD. A 32gb memory card can store around twelve hours of video at this resolution. VGA: The lowest resolution is 640 by 480. This is the resolution everyone used for the first 60 years of TV. This is also better resolution than the VHS tapes many people still have. Using this setting, you could take 20 hours of video on that 32gb memory card. Your phone can handle up to a 128gb memory card. Use the Video Stabilization setting unless you like the feeling of being seasick. It’s turned on by default.